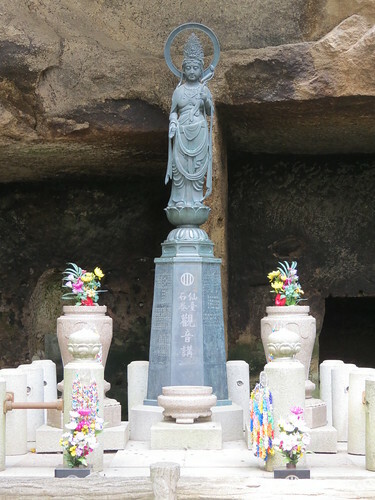 In my last post I wrote about a morning visit to Shiogama (塩釜), and left you waiting for me to move on to Matsushima (松島). 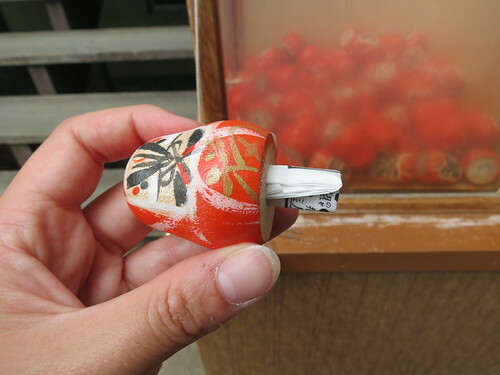 So, here goes! 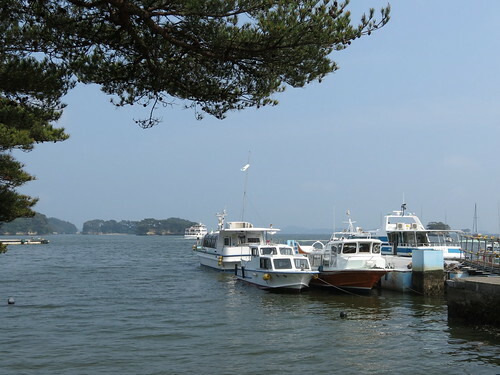 After visiting Shiogama Shrine, I made my way back to Hon-Shiogama Station and waited for the next sightseeing boat to Matsushima. 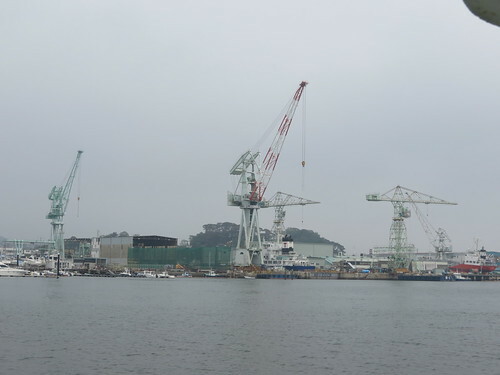 It was a dull day, and very quiet, and there wasn’t a huge amount to do whilst I waited for the boat. 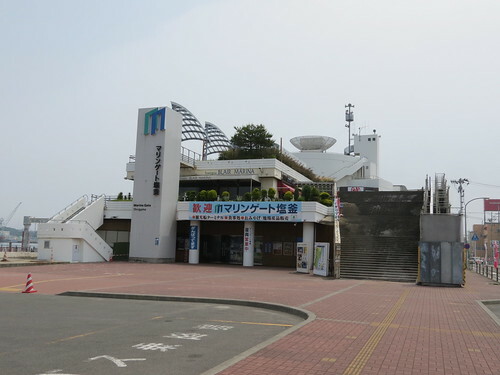 But I managed to amuse myself by looking around Marine Gate and trying to read the information about how the 2011 tsunami had affected the area. 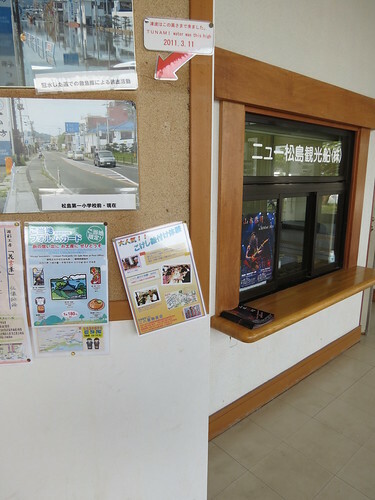 There was a sign in the building showing how high the water had reached, and some temporary buildings nearby. 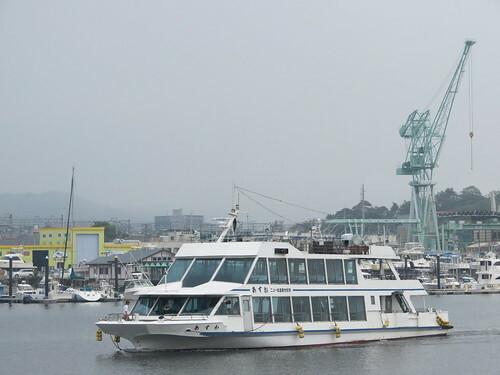 Finally the boat came along! 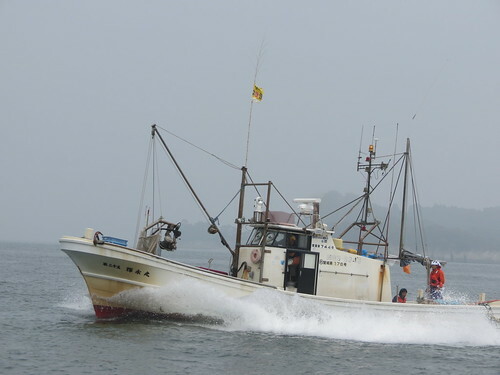 There weren’t many people on board, and most people stayed undercover, but despite the cold wind I decided to ride on the back of the boat to take pictures. 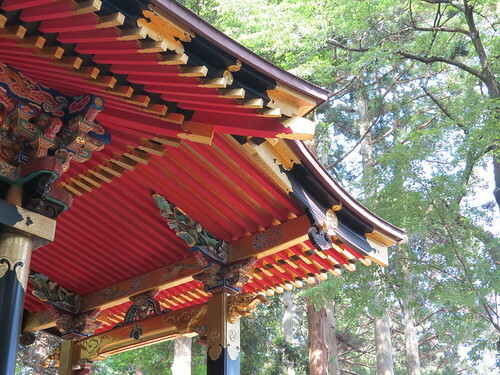 It should have been a beautiful journey, but it was quite hard to see the things that the recorded announcement alerted passengers to in both English and Japanese. 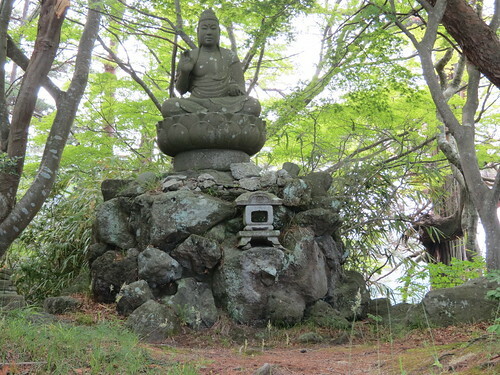 “To your right you can see…” No, I really couldn’t see much at all! 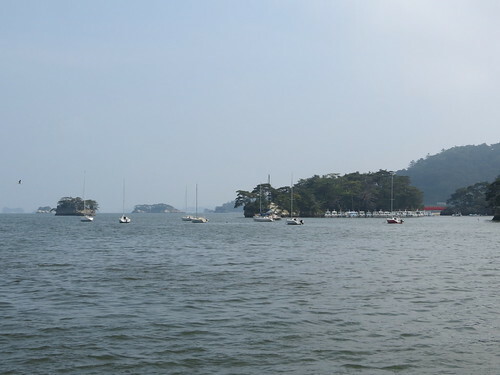 Matsushima Bay is known as one of Japan’s three most scenic views, along with Miyajima (宮島) and Amanohashidate (天橋立). 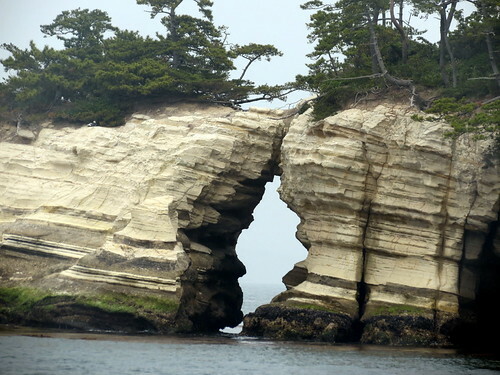 It certainly was quite impressive to see, even though I wasn’t seeing it at its best. 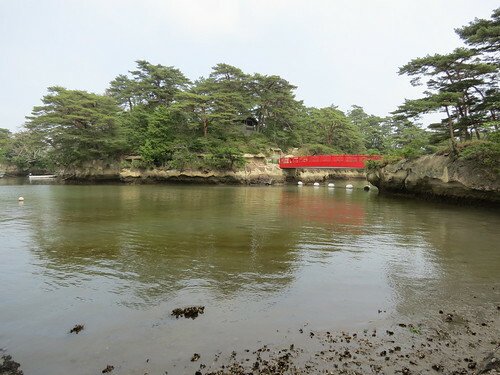 Once the boat docked, I set off to explore the main island and all of the small islands which are connected to the mainland by red bridges. 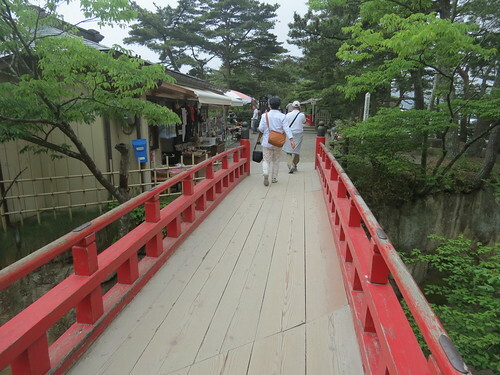 Matsushima is a really quaint seaside town, and I quite liked it actually. 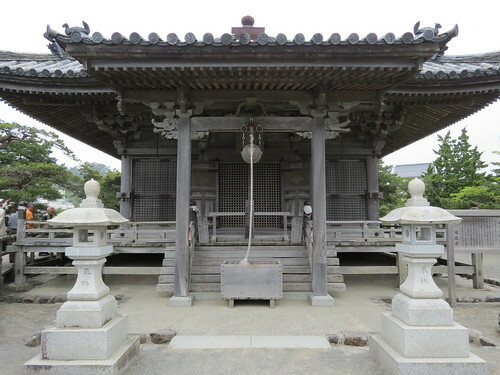 First I visited Godaido (五大堂), a small temple near the pier which is something of a symbol of Matsushima. 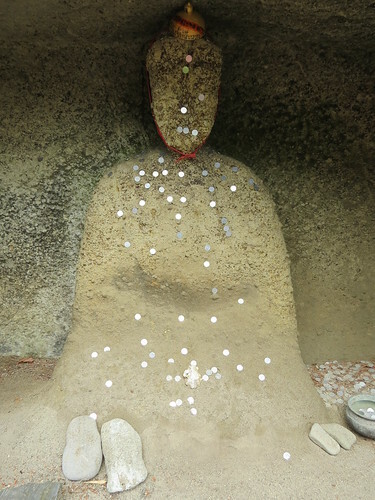 It’s amazing that this temple, exposed as it is, didn’t suffer any damage in the tsunami. 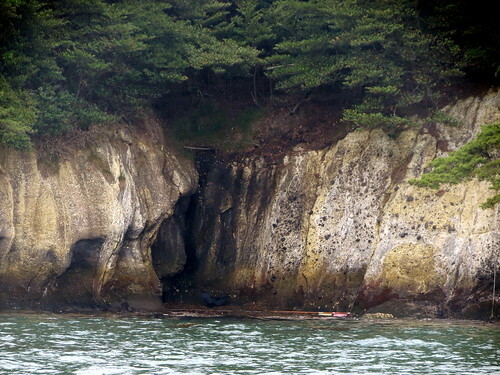 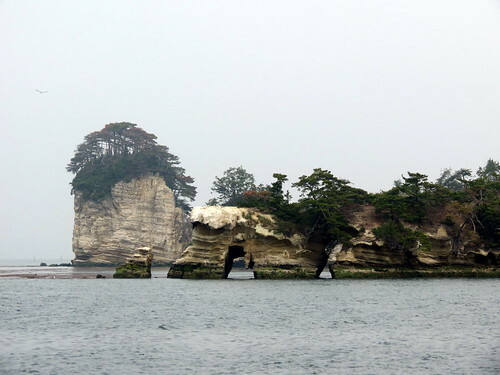 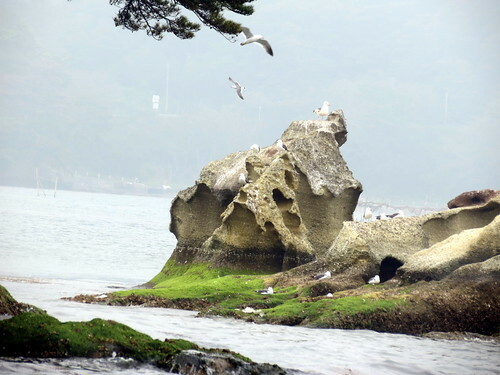 The next island I visited was one of my favourites – Fukuurajima (福浦島). 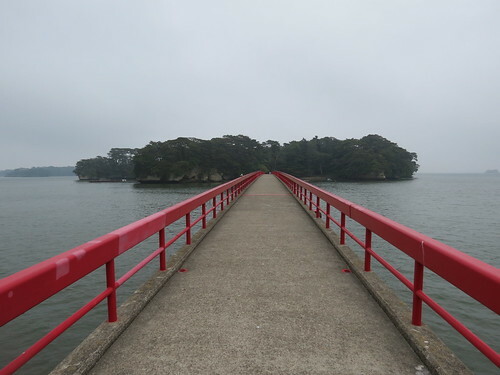 The bridge connecting this island to the main land is 252 metres long, and there is a 200 yen charge to enter the pine-covered island. 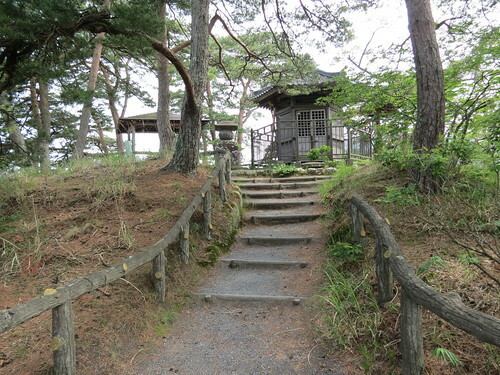 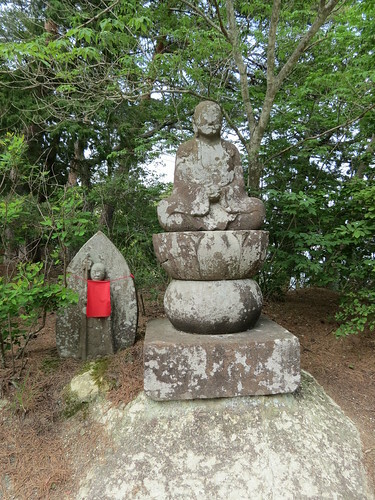 The island is a natural botanical garden with walking trails and a small shrine, and I found it very peaceful. 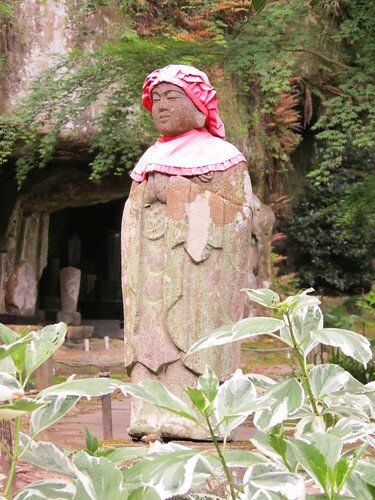 As I wandered back around the main land I became a woman on a mission. 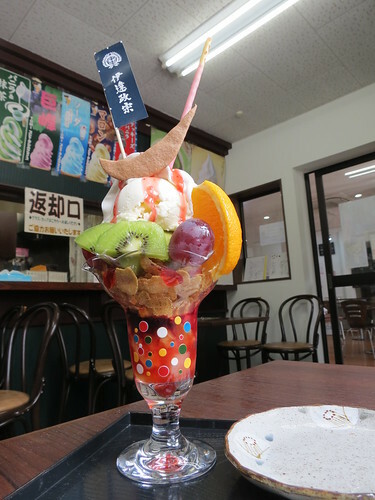 A few days previously I had read on Facebook about a special kind of parfait that was available on the island, and I was determined to find the shop selling them! 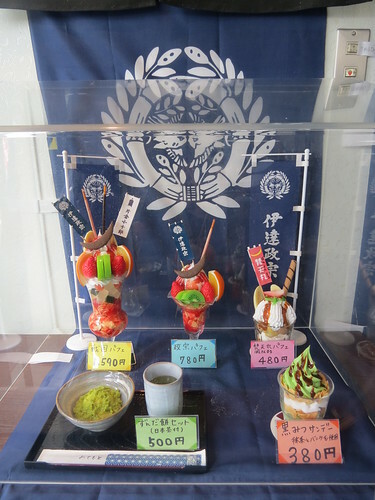 As it happened, the shop selling ‘Date Masamune Parfait’ was easy to spot! 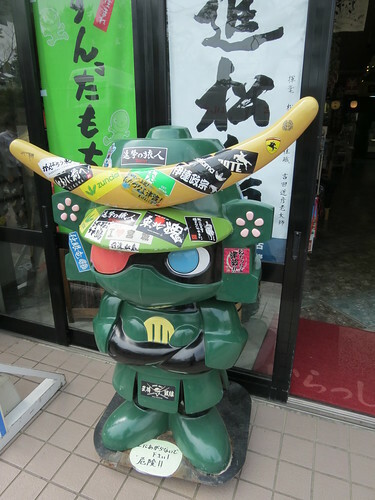 Well, I was on holiday after all! 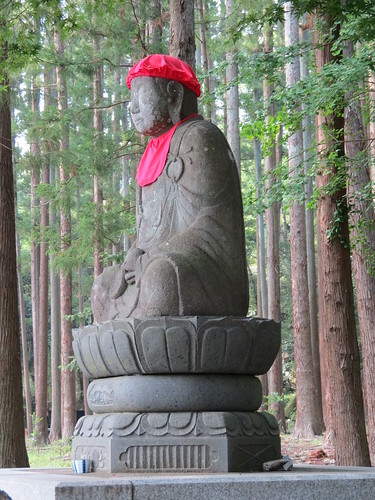 Date Masamune (伊達政宗) (1567 – 1636), a legendary warrior and leader who founded modern-day Sendai, was all over Matsushima. 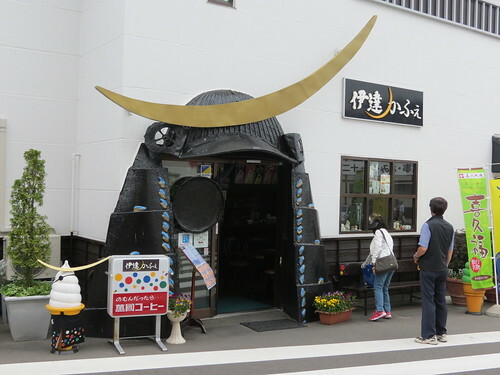 Everywhere I went I found his iconic crescent helmet design. 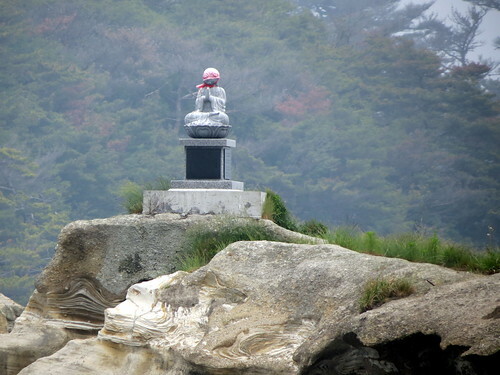 The next island I visited was Oshima (雄島), which was also one of my favourites. 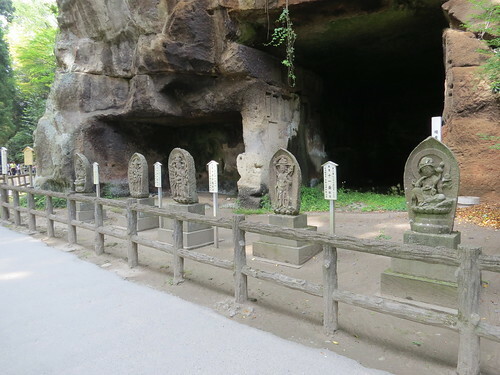 The small island, which is free to enter, used to be a retreat for monks and there are still some decorated meditation caves on the island. 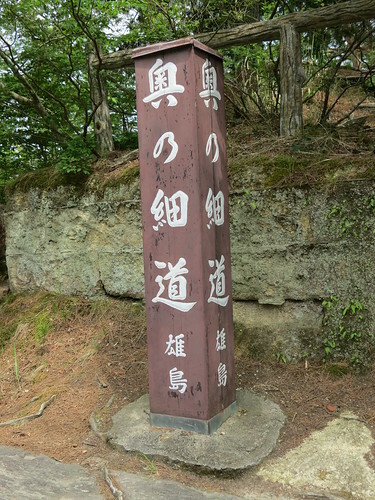 Basho visited Oshima, and on the island I found a marker for the Oku no Hosomichi (奥の細道 / Narrow Road to the Deep North). 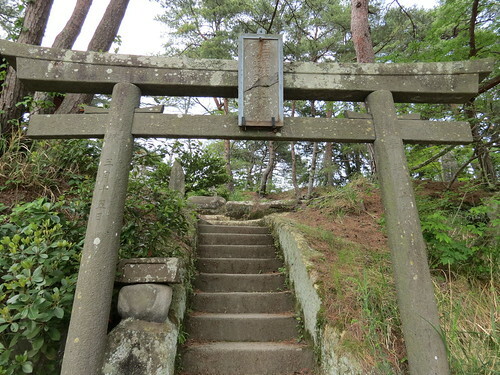 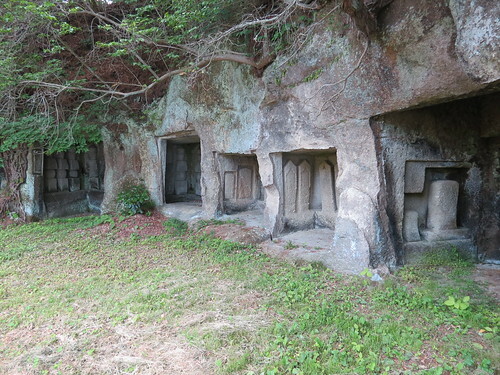 There are some in other parts of Matsushima too. 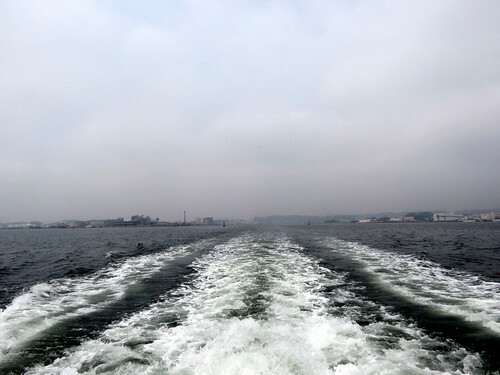 Returning to the mainland I was pleased to find the weather had cleared up and it was actually quite a lovely day to be by the coast! 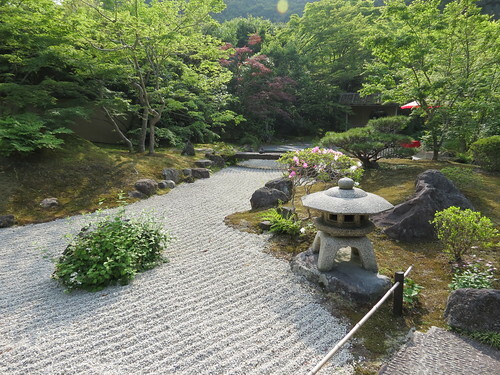 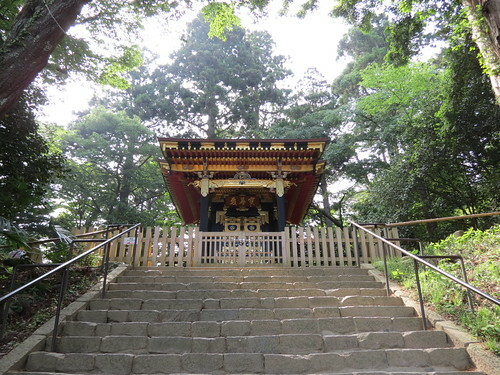 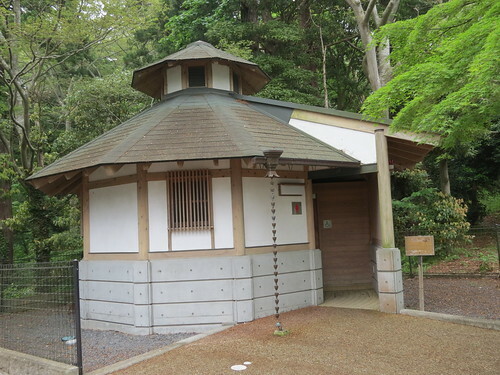 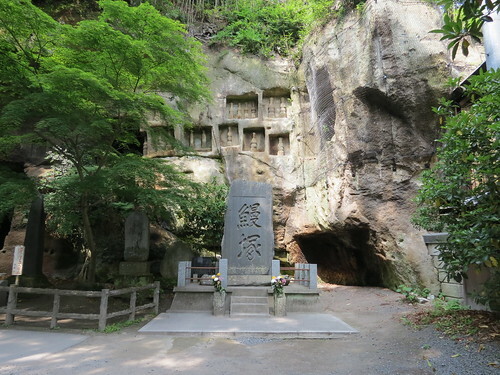 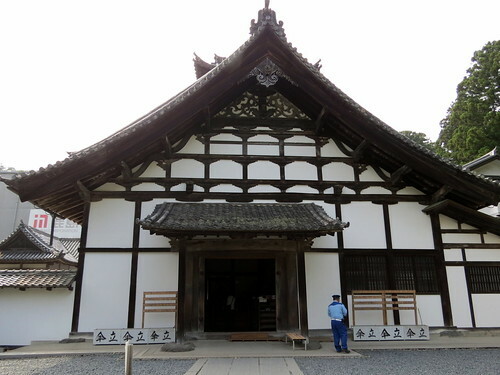 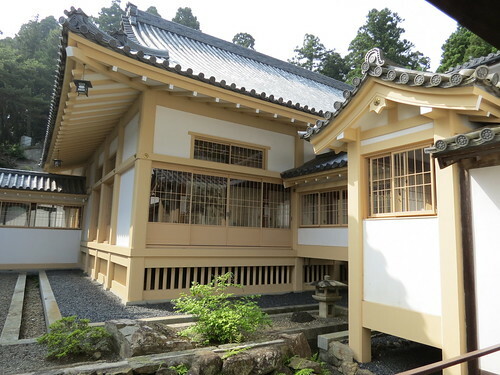 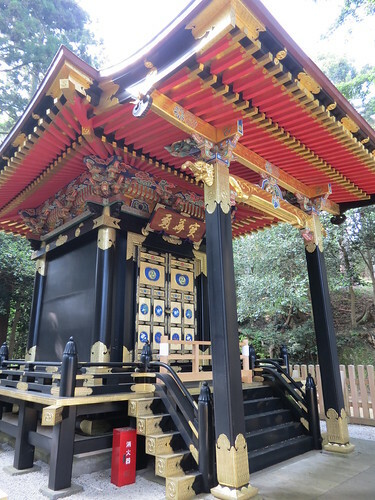 The last destinations on my list were the Zuiganji (瑞巌寺) temple complex, and nearby Entsuin (円通院). 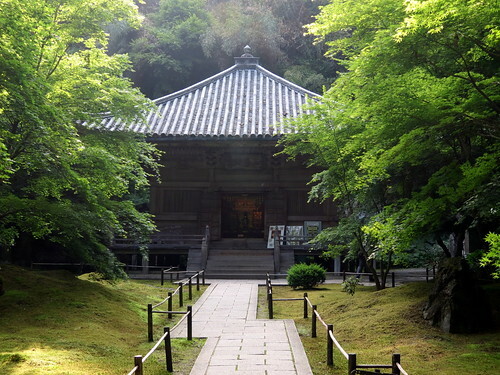 Zuiganji is one of Tohoku’s most famous and prominent Zen temples and is the family temple of the Date clan (伊達氏), and Entsuin, a temple near to Zuiganji, houses the mausoleum of Date Mitsumune (1627–1645), the son of the ruling local feudal lord Date Terumune (1543 – 1585) and brother to Date Masamune. 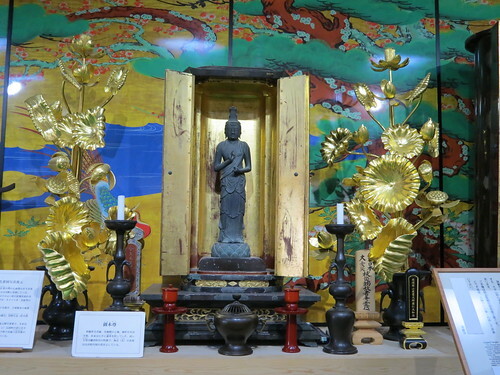 Mitsumune died at the age of 19, and the temple was built in his honour and devoted to the goddess Kannon. 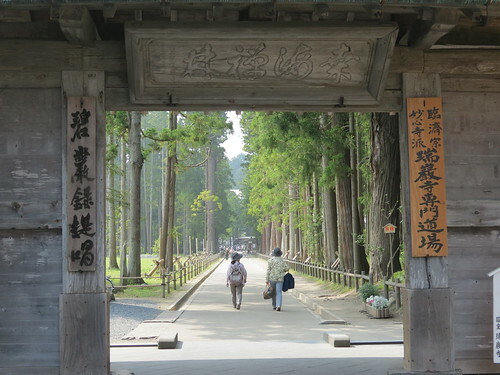 The entrance to Zuiganji is through a large gate and down a wooded path – it’s quite impressive! 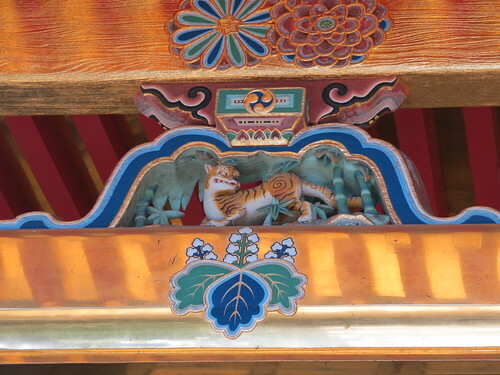 The main temple building is currently undergoing restoration, but there is still plenty to see. 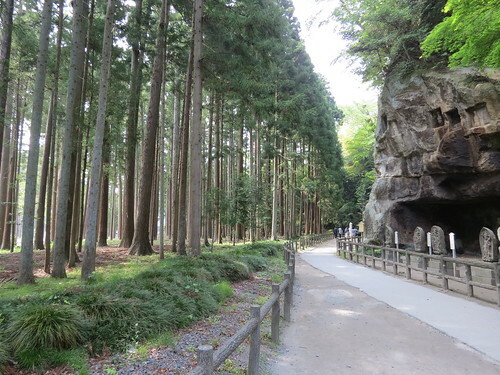 Cedar trees line the paths leading to the temple buildings, and down the side path there are a number of old meditation caves which now house Buddhist statues. 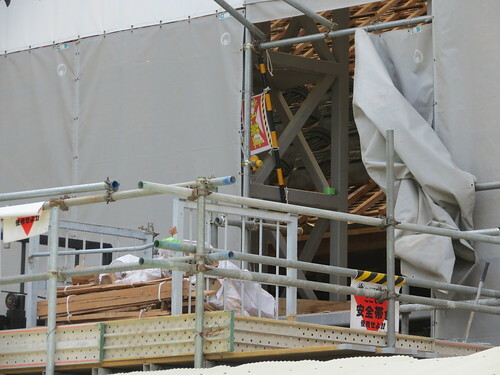 Some buildings are still open and visible, despite the reconstruction work. 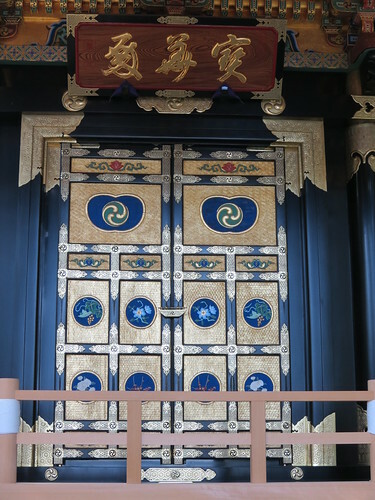 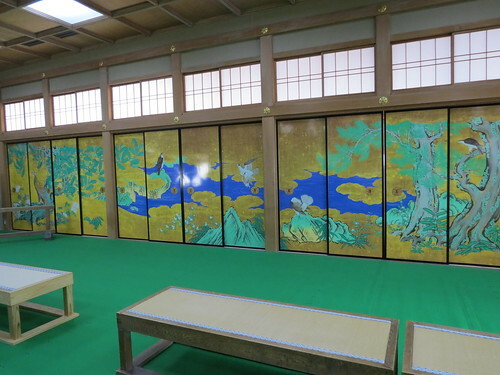 When I visited there was also a special exhibition of Yotokuin’s Mausoleum, which is normally off-limits but is temporarily open to the public for viewing. 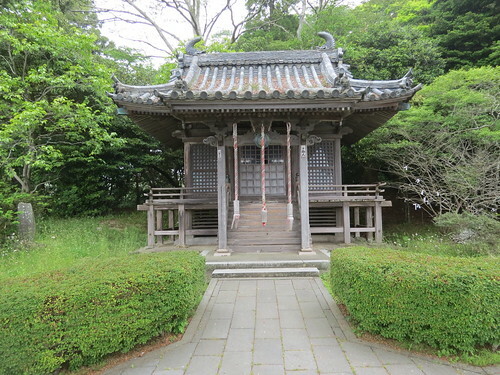 This is the mausoleum of Date Masamune’s wife, Megohime (1568 – 1653). 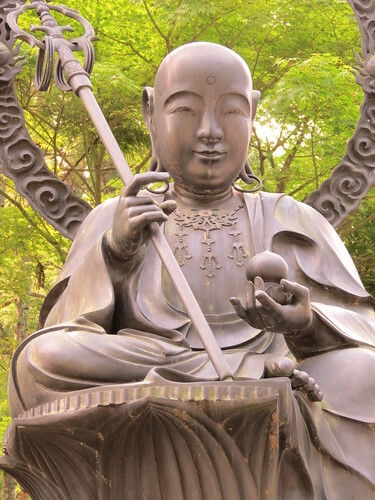 ‘Yotokuin’ is the Buddhist name given to Megohime. 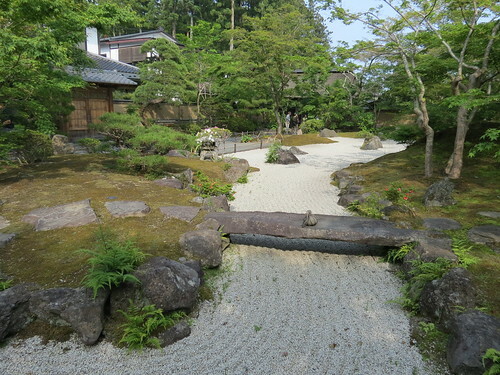 Entsuin is much simpler in design, and features moss and stone gardens. 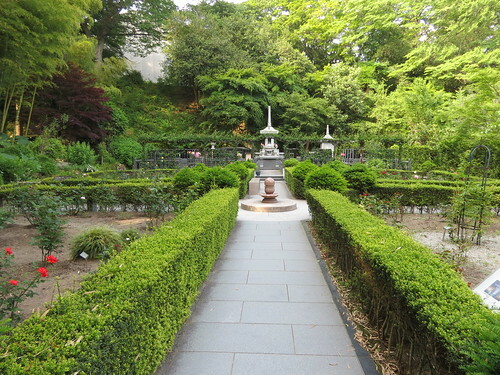 I never promised you a rose garden… but here’s one anyway! 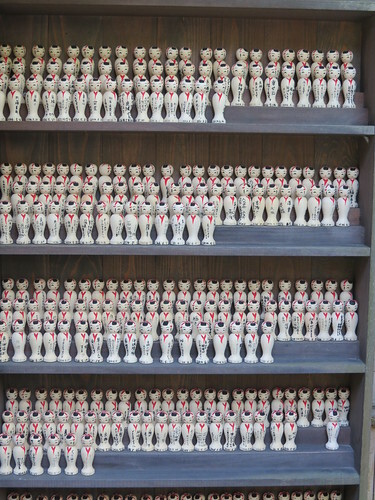 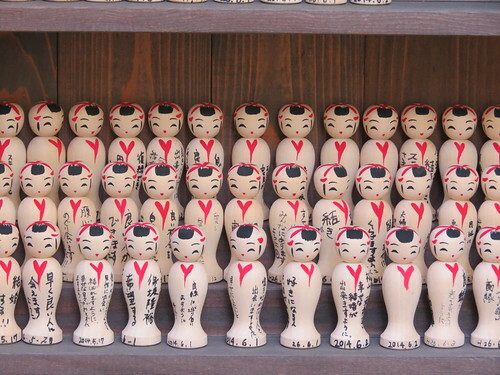 Inside Entsuin I found hundreds and hundreds of small kokeshi dolls, which seemed to be being used for prayers, much like wooden ’ema’ plaques. 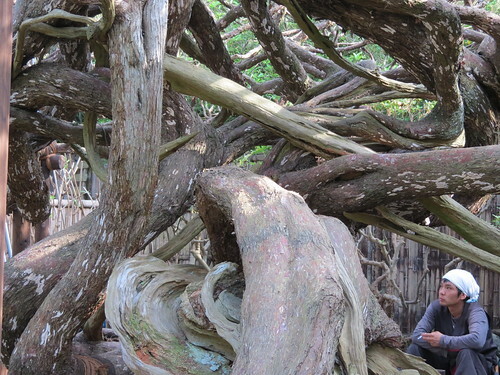 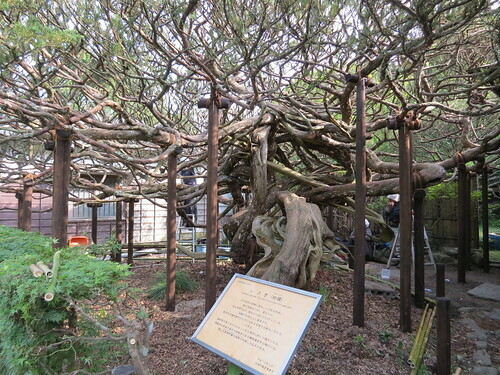 The temple garden also features a yew tree which is said to be more than 700 years old. 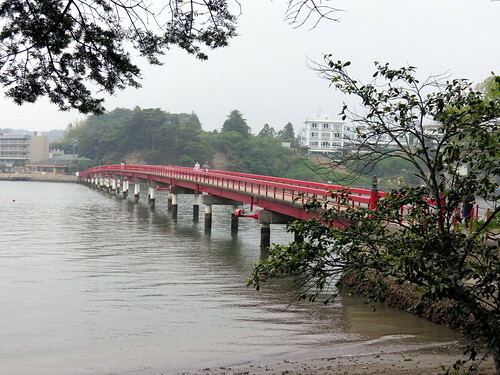 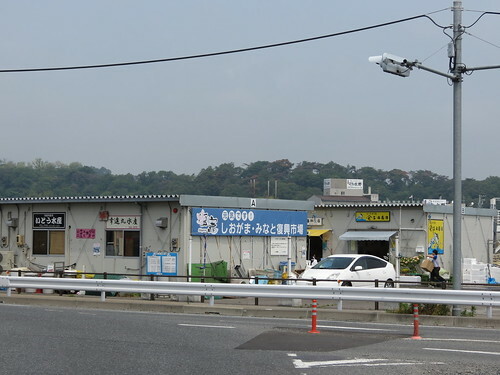 Matsushima was of course affected by the 2011 Tohoku tsunami, and that is quite evident in places, but generally the island has been well cleaned up and repaired. 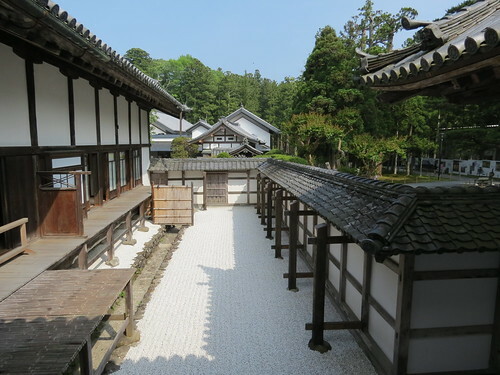 There is a slightly tired feel to the place though, and everything does look like it could do with a coat of paint and a freshen up. 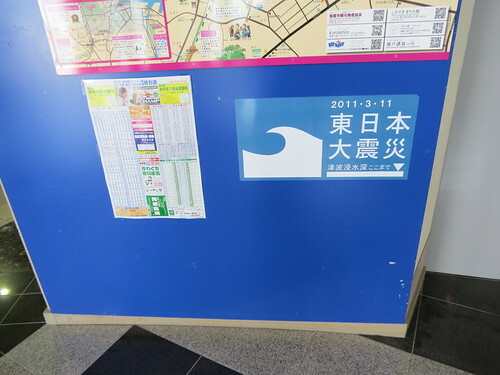 In the tourist information centre near the pier there was a display about the tsunami, and a marker on the wall showing how high the water reached. 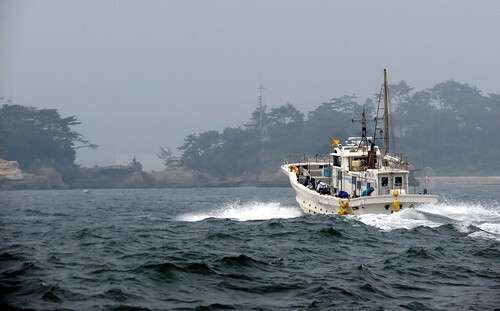 Taking the boat out into the bay across the choppy water and then seeing these photos of the tsunami really made me think. 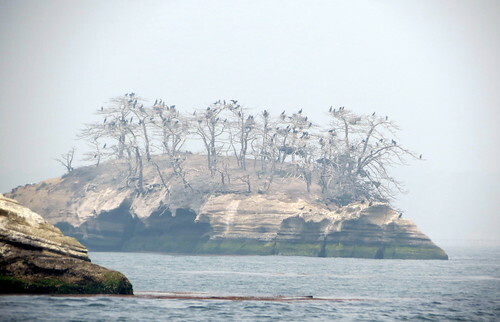 Disasters like this can strike out of the blue and there’s very little we can do to prepare ourselves for them. 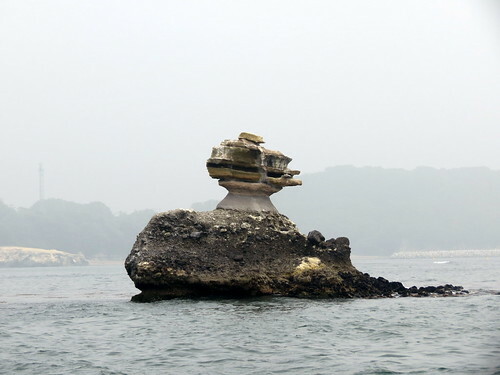 I’m glad Matsushima has survived and, although it’s a little tired around the edges, I would really urge tourists to go there and see one of Japan’s top scenic views. 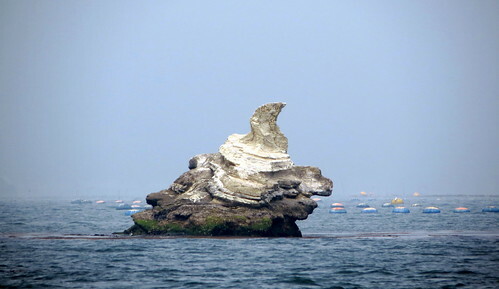 Catch it on a good day, and it will be absolutely stunning! 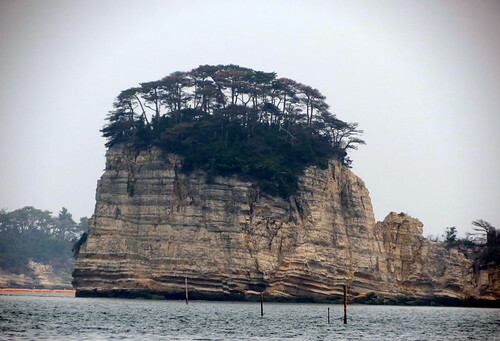 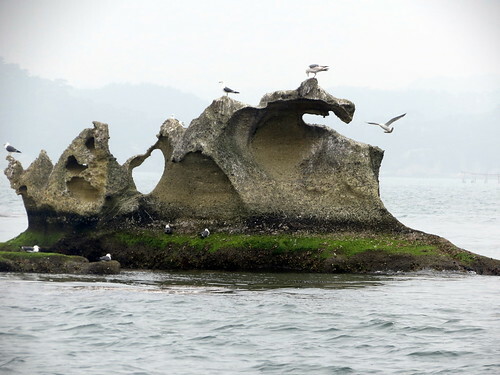 Matsushima – a top view!